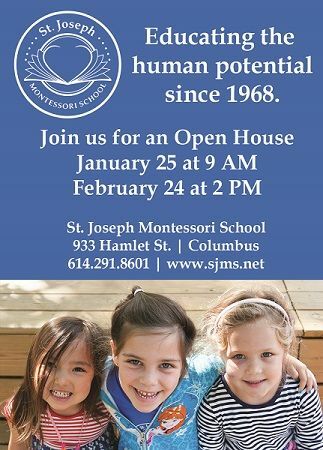 Join St. Joseph Montessori School for an Open House on January 25 at 9 AM. Currently enrolling Pre-K-8th Grade Students for the 2019-2020 School Year. St. Joseph Montessori School is a Pre-K through 8th grade Catholic Montessori community committed to a learning environment that respects the uniqueness of each child in reaching his/her full potential. For 50 years, St. Joseph Montessori School has been inspiring students to become innovative thinkers and passionate learners. The school is a place where children are deeply engaged in the excitement of learning, a process that both challenges and nurtures them and develops self-confidence, competency, imagination, and the desire to lead lives of positive influence. Its Montessori curriculum integrates a philosophy that promotes higher order thinking and abstract reasoning skills for students 3 years old through the 8th Grade. This remarkable program gives its students a deeper understanding of the connection between academics and the outside world. St. Joseph Montessori School is a community that understands and values the connection between younger and older students. School Hours: Monday-Friday 8:15 AM-3:15 PM with extended care available.